HM1010 Light Brown Costume Shorts. These traditional German leather shorts are sure to add a touch of class to any occasion and are made from 100% deerskin leather. These knee length shorts are made from a lightly textured medium brown leather that really strikes a chord. 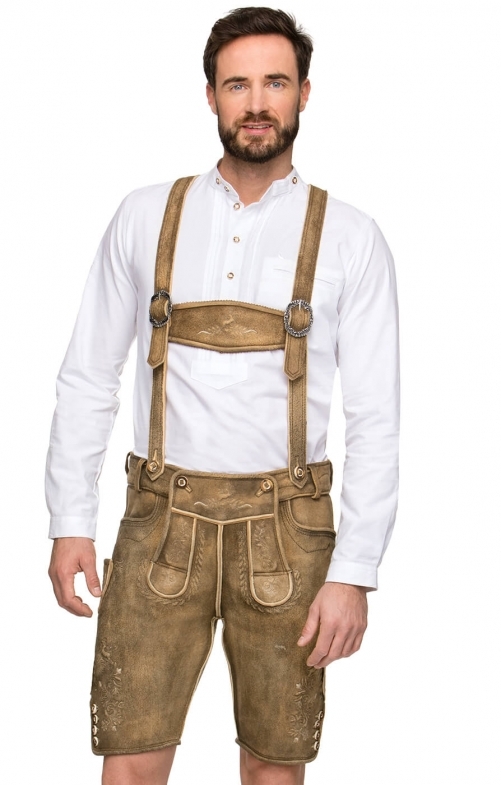 The medium brown of the leather is offset by traditional German light coloured embroidery, which is present on the cuffs, front and waistband of the shorts. The cuffs of each leg feature a row of four horn buttons. The waistband has both loops for both a belt and buttons that can be used to attach traditional suspenders.